World's Largest Coin is a large nine metre (30 ft) tall replica of a 1951 Canadian nickel (5 cents coin) which was issued to commemorate 200 years of isolation of nickel metal. 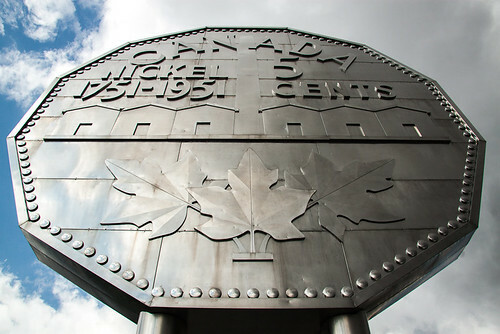 The large coin known as the "Big Nickel" was installed in 1964 and is the brain child of local businessman Ted Szilva. 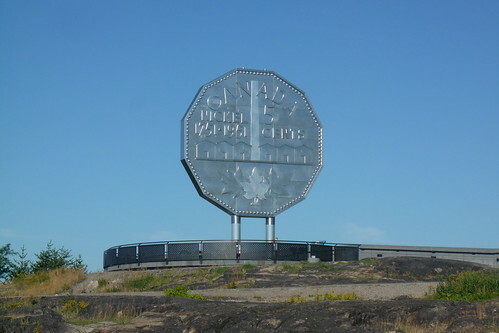 The twelve-sided, 0.61 metres (2 feet) thick coin is located on a hillock in the grounds of Dynamic Earth, Sudbury, Ontario, Canada and is listed in the Guiness Book of World Records as the World's largest coin. Made of stainless steel plates it represents nickel metal - the major produce of Sudbury. The coin depicts the Sudbury nickel refinery on one side and head of King George VI on the other side.